A wonderful portrait of Creasy Brown Wood (see Creasy Brown Woods buried at Dupont, GA) was recently contributed by reader, Katie Frost. In the early 1900s, Creasy Brown and husband George Washington Wood kept their household just west of Ray City, in the Connells Mill District. Creasy Brown, wife of George Washington Wood. Around 1910, the Woods made their home in the Rays Mill area. Image courtesy of K. Frost. Creasy Brown, born August 14, 1877 was a daughter of Sarah Hughes and James Brown. 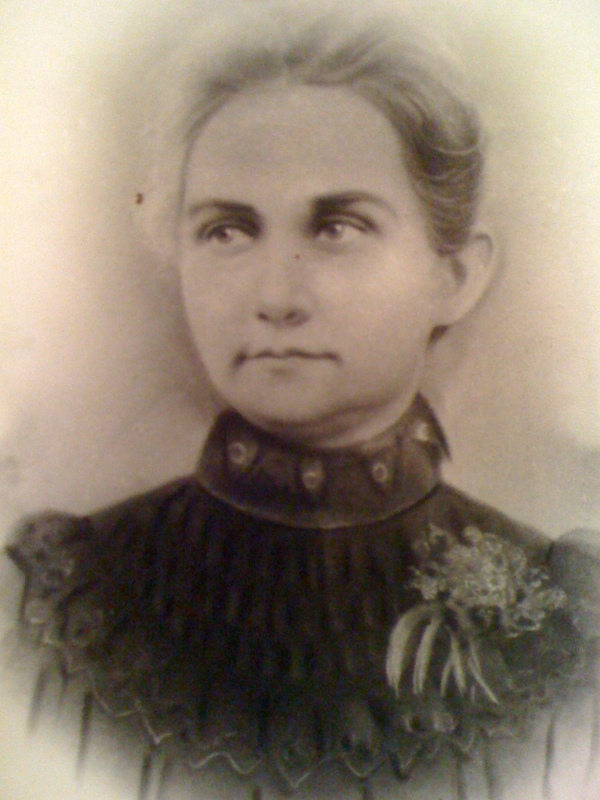 Her father was a veteran of the Civil War, having served as a private in Company D, 26th Georgia Infantry, Confederate States Army. Her mother, Sarah M. Hughes, was a daughter of Nancy Hutto and William Hughes. About 1903 Creasy Brown married 18 year old George Washington Wood. She was 25 at the time. The couple made their home on a rented farm in the Connells Mill District, the 1329 Georgia Militia District, near the town of Rays Mill. George worked the farm and Creasy assisted with the farm labor. By the time the 1910 census came along they were also raising four kids. The year 1911 brought tragedy. In September Creasy was down with illness; by early October she knew the end was coming. After weeks of illness she passed away on October 10, 1911. Her obituary mentions she was survived by her husband and five children. She was buried at North Cemetery, Du Pont, GA, about 20 miles east of Ray City. Children of Creasy Brown and George Washington Wood. 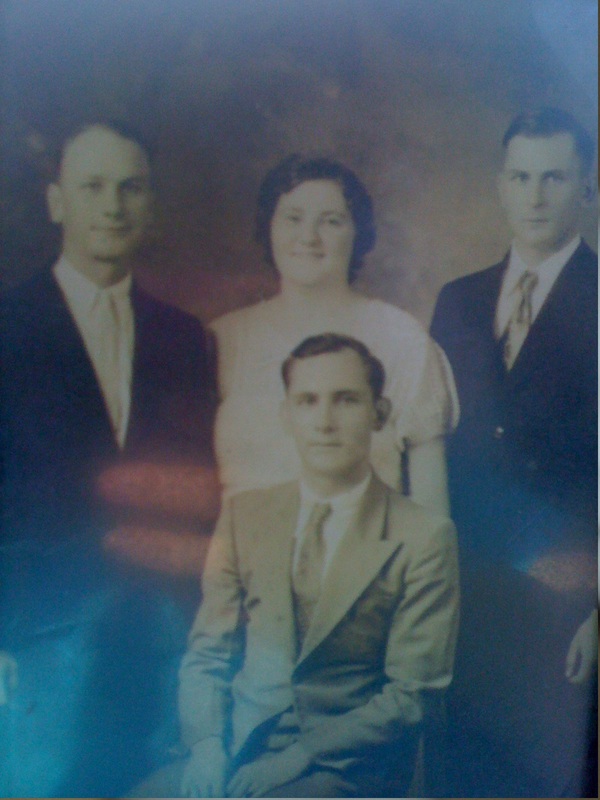 Left to right: Gruvey Silas Wood, Hattie Wood, Remer Wood, and Leon Wood (seated). Image courtesy of Katie Frost. George Washington Wood later moved to Savannah, GA and married Fannie Lou Taylor. I so enjoyed this article. It was interesting to relate Ms Creasy Brown Wood to Remer Wood. Remer and his wife Jewell lived next door to my Aunt Mildred Clements Fountain. I remember Remer having a smoke house out back of his house with hams, sausages and his home brew inside. My cousin Jimmy Fountain and my brother Larry Carter were found in the ‘smoke house’ one day imbiding on Remer’s peach brandy (they were about 11 I think). Perhaps just a mistatement, however the Connells Mill District is west of Ray City. I didn’t recognize granddaddy from this picture because I never saw him young before..he died when I was a young girl..I am Kathleen g. Wood (s) I use the plural s.So just saw a pic.of my great grandmother. Awesome! Seated in the picture above is Remer Wood. Leon Wood passed away in 1922…..well before the picture was taken. Leon wood did not die until I was about 8 or 9.yo..he was my granddaddy, I should know..grandma’s name was Bessie Mae wood (don’t know her maiden name) true I may have mistaken the picture.I may have that confused..however my grandparents had 13 kids..granddaddy was a share cropper, woodsmith, and preached fire and brimstone..and I assure you he had a smokehouse outside his house with an outhouse out back..later he lived in allenhurst Georgia for a short while before he moved and then suffered a heart attack..and died..Leon wood lived a long life..he did not die in 1922.. I assure you. There’s more than one leon wood..I see that I am way off..but also confused..my grandaddys name was leon wood..and he had a smoke house out front(across the dirt road,from the front door of his old wooden rambling house) and an outhouse out back)..next to corn fields..he and grandma had 13 kids..with uncle Glen being murdered/shot when I was a young girl. (long story-no need).later they lived awhile in allenhurst ga..they moved to Hoboken ga.(he suffered a heart attack and died.) My favorite uncle on daddys’ side was Elton wood…Daddy was Dan wood..I geuss I had the wrong leon wood..which means I’m not related to the lovely Mrs.Creasy Wood either..so be it..it is what it is, the search continues.